Bahia Halawi is an entrepreneur, big data enthusiast and data journalism specialist. She is also a data scientist who is planning and putting strategic road map to implement data journalism academic program in different universities as well accomplishing several projects as part of her data science work. 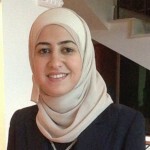 Bahia have completed her degree in computer sciences from the Lebanese American University. Currently, Bahia is enrolled in masters in computer science at the later University and working mainly as a research assistant in the field of machine learning and data science as a thesis in a co-education duty. Bahia is well known for her public speaking and debating skills as she is a frequent speaker at events and conferences related to the big data world and a data journalism trainer acting inside news rooms. Bahia's goal is to spread the knowledge and literacy of big data in general and data journalism in specific to reflect her "data for good" initiative. In addition, she aims to improve machine learning techniques and initiate workshops for the same topic at her university.